Polymethylmethacrylate, also known as PMMA, is a rigid and transparent thermoplastic material obtained by the polymerization of methyl methacrylate. 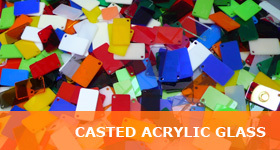 The plates can be obtained by two different manufacturing processes, Extrusion & Casting..
Acrylic glass stands out against other plastics, especially in terms of transparency, easy molding and resistance both to weathering and scratch. Within the market it competes with materials such as glass for its low weight, better transparency and lower fragility, aluminium for its hardness and wood for its rigidity. 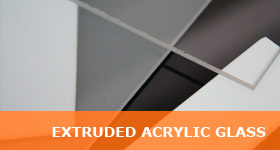 The acrylic glass plates are machined and formed by means of very varied industrial, craft or art procedures. Transparency, around 93 % (it is the most transparent plastic). Very easy to machine and mold. High impact resistance (around ten/twenty times over glass). Resistant to weathering and UV rays (no appreciable aging after ten years of outdoor exposure). Continued margin of temperatures from -90ºC to +85ºC. Light if compared with glass (about the half). With a density of around 1190 kg/m3 (it is only slightly more dense than water). Easy combustion, not self-extinguishing (it does not go off when removed from fire). It does not produce any toxic gas when burning. Acrylic glass presents great resistance to many compounds, but it is affected by others, among them: Ethyl acetate, acetone, alcohol, benzol, chloroform, etc. Signposting: signs, neon signs, indicators panels, display stands and advertising at the place of sale, etc. Architecture, decoration and public works: urban furniture, doors, glazing, skylights, domes, balustrades, lanterns, acoustic screens. Health: bathtubs, showers or sinks. Car: license plate, side deflectors, etc. Many specific applications can be added to this list: tanning beds, wash stations, rear projection, screens, precision parts, machine protection, etc.